Ninja Gear: Interaction Fitness/Ninja Warrior Training Oz. Let’s face it, one of the hardest things about preparing for Ninja Warrior isn’t simply maintaining fitness. Anyone who wants to be the next Ninja Warrior normally takes their training pretty seriously. The hardest part of preparation is that if you do make it to the course, you’re going to be dealing with obstacles you’ve never seen before and having to get it right the first try or be sent home via the water. The best way to prevent the unknown defeating you, is to build your own obstacles, but if you’re like me, you can barely cut a straight line in a piece of timber. You’re going to need someone else’s expertise. That’s where Dave Garvin of Interaction Fitness comes in. Dave is an obstacle racing veteran who has representing Australia in the Obstacle Course Racing World Championships (before he was even an Australian citizen I might add) and has recently been heavily involved in creating new Ninja holds for the events at The Compound Training. For 6 years Dave worked making props for movies/tv and corporate functions. His experience in many different techniques and materials means that no concept is too bizarre. I first experienced Dave’s work at The Compound’s inaugural Ninja event in March of this year. 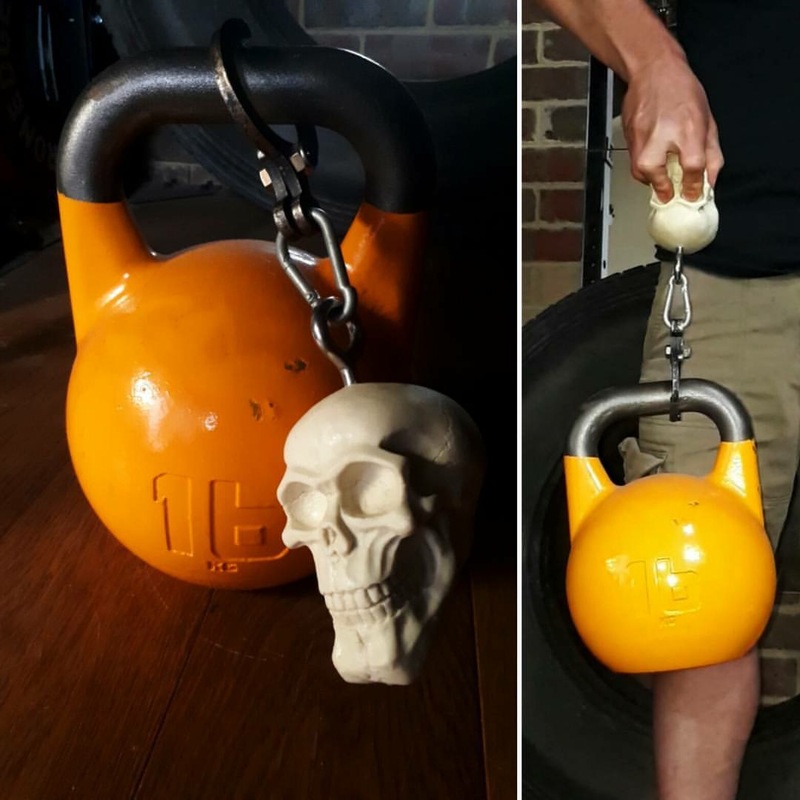 When walking around the event my eye was caught by some colourful grip strength tools in the shape of skulls. Having just spent an arm and a leg purchasing some Atomik Climbing Holds from the USA, I was stoked to see something being produced locally, and at an incredibly fair introductory price. What I didn’t realize was how deceptively difficult it would be to hold on to those skulls at my current ability level. Since then Dave has expanded his range to include nunchucks, half-chucks (for pull-ups and precision grip work) and what has been named “the mace”, a mix of a nunchuck and cannonball. If you can think of something you want to hang from, Dave can make it! 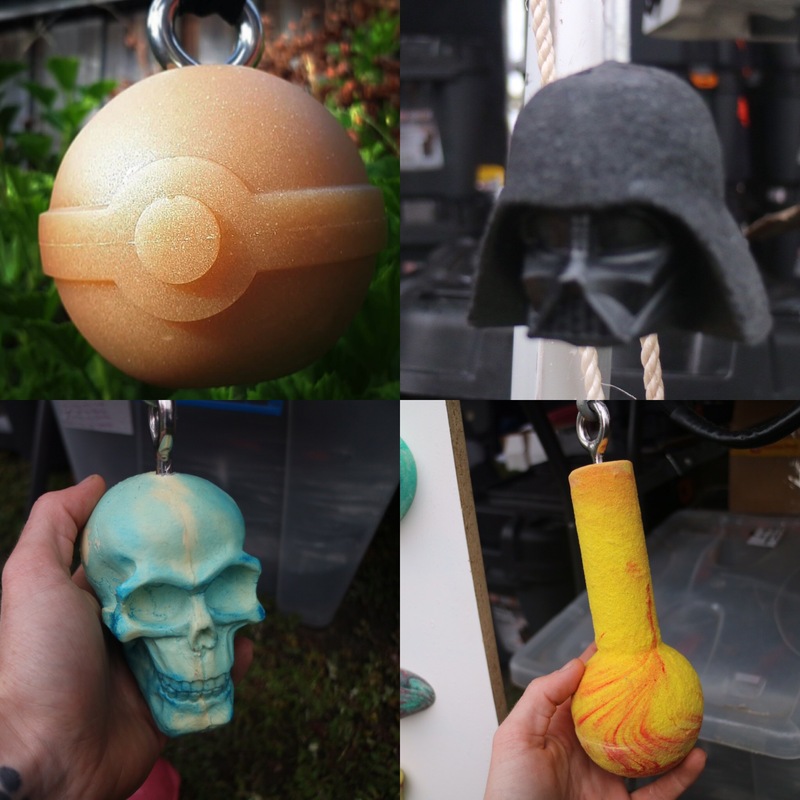 Dave also custom makes a variety of different themed holds and is willing to give any idea a crack if you have a special order. Some of his more creative work included a Darth Vader hold, a Pokeball hold and a batman shaped rock climbing hold as well as the ability to use glow in the dark eye to make any hold useful at all hours. These holds are made from pure polyurethane with no additional fillers (except glow in the dark pigments!) featuring an 8mm 316grade stainless steel eyelet cast into the hold. Then depending on which hold you’re looking at they either have a smooth finish for a hard grip workout, or a dual texture rough finish to help your hands stay where you want them to be. The simplest way to use these holds is to simply hang them up on a bar anywhere with rope or a rock climbing sling and carabiner and hang from them. That however would be totally selling these holds short on all the other ways you can use them to maximize your grip strength. Tying your hold to a kettlebell or weight plate and walking a set distance is a sure fire way to get a forearm pump going. Grips aren’t just for hanging. Using a pinch grip on your holds you simply pull straight up and control the descent for the number of reps you desire. They do get the girls as they say. Attach your holds to a barbell or dumbbells, squeeze your grip and curl your way to a better grip. To make it even more challenging, use an overhand grip on your holds and do reverse curls. Similar to the farmers carry but you simply hold your grips out in front of your with weight attached for as long as you can and try to improve the time each week. So what are you waiting for? If you want a stronger grip to crush those obstacles then head on over to www.interactionfitness.com.au or www.ausnwt.com and have Dave sort you out or if you’re unsure and want to test out these grips for yourself head on down to The Compound Training or Beyond Movement. ← Australian Ninja Warrior Premieres Tonight! → AusNW Season 1 Episode 1 recap!